John Elrod, Does He Know Anything? Over the last few years there has been a rash of what I call John F. Kennedy assassination "groupies." The assembly includes the likes of Ricky White, Chauncey Holt and Jim Files. All have come forward claiming they have something valuable to contribute to assassination lore. Of course, these people required a publicist. Someone that could "investigate" the story in such fashion that it is half way believable, at least to those with little knowledge of events. Ray and Mary LaFontaine a husband and wife "research" team published a 4700-word article entitled The Fourth Tramp. It's about the November 22, 1963 Dallas police arrest of John Elrod. The piece appeared in the August 7, 1994, Washington Post. John Elrod, a 31-year-old cook was living in Memphis in 1964. He was an admitted alcoholic who "After drinking an unknown amount of beer and vodka, [he] wound up at the Shelby County Sheriff's Office in downtown Memphis. There he volunteered that something was preying on his mind." What the LaFontaines believe was preying on John's mind is revealed in the article based on their interviews and additional research. Ray and Mary say Elrod was arrested November 22, 1963 at 2:45 p.m. by the Dallas Police and as such became the fourth tramp. He was placed in a cell with two other men. Within a few paragraphs we discover the men are Lee Harvey Oswald and a nineteen year old car thief from Memphis, Daniel Douglas. Late on November twenty second the trio observe the police bring in another man. The man has sustained injuries to his face. Elrod claims his cellmate, Lee Oswald, recognized the man with the "smashed up face" as Lawrence Miller. Oswald told Elrod and Douglas at one time he saw Miller in a motel room with four other men, one being Jack Ruby. Oswald related the men in the motel room, including Miller, were advanced money under some type of contract. Elrod claimed Lee's sighting of Miller triggered Oswald's revelation of the motel room meeting. So how did Miller end up in the same cell block as Elrod, Oswald and Douglas? "According to court records from the resulting criminal trial, [the] lawmen (on November 18, 1963) crouched in two unmarked cars watching a pale blue 1962 Thunderbird convertible pull up alongside a white Dodge. They saw two men get out and start passing a number of high-powered rifles and shotguns from the white car to the adjacent convertible. When the Thunderbird pulled away, the FBI agent and two detectives radioed for help. Two Dallas police officers cruising nearby in their squad car followed radio instructions to arrest the men in the Thunderbird for a traffic violation. When the patrolmen turned on their toplight and honked for the Thunderbird to pull over, the convertible sped off." "The ensuing chase through downtown traffic reached speeds of 60 mph. Five blocks later the Thunderbird sideswiped two cars, tried to make a left turn at full speed and crashed head on into a utility pole. The driver of the Thunderbird got out and managed to run some 30 feet before being tackled and arrested. His name was Donnell Darius Whitter." "The passenger in the blue Thunderbird was unable to leave the car. His face had smashed into the windshield. He was identified as Lawrence Reginald Miller. He was treated at the emergency room of Parkland Hospital and charged with multiple criminal violations arising out of the incident. After having his face stitched up, Miller was remanded to the Dallas city jail." You have to believe the Dallas Police Department placed their prime suspect in the assassination of John F. Kennedy and J.D. Tippit in the same cell with a man who had a "history of alcoholism" and a nineteen year old "confessed car thief." You have to believe Miller who was already in the jail since the evening of November 18, 1963 was being moved around in the cellblock and this movement took place only when Elrod, Oswald and Douglas were in their common cell. Unfortunately, there is no way of knowing the order in which the three were placed in the cell. We only know both Elrod and Douglas were there when Oswald made his revelation. You have to believe that Oswald who was tight lipped with the police, FBI and media became effusive in the presence of a drunk and car thief, both of whom he had never met before. This would imply Oswald was too stupid to think the police would plant someone in his cell to pump him for information. You have to believe Elrod after drinking an unknown amount of beer and vodka marched into the Memphis sheriff's office and related portions of this story. Even the LaFontaines have trouble with all this. They question "Is Elrod's story really credible? Given Elrod's history of alcoholism, his account must be treated with caution." I, for one, don't believe they want us to treat the story with caution otherwise there would be no sense in writing about it in the first place. Let's discuss the Dallas gun dealer identified as John Thomas Masen. Masen, the LaFontaines assert, owned "The only store in the Dallas area that sold the type of ammunition used in the shooting of President Kennedy." What ammunition was actually used in the assassination? We've been subjected to so many conflicting stories just who do we believe? Ricky White said his dad used a 7.65 Mauser, the Warren Commission claimed Oswald employed a 6.5 Mannlicher Carcano, Robert Easterling maintained Manuel Rivera used a 7-mm Czech made automatic and Jim Files confessed he fired one shot from a .222 Fireball pistol! Other people who have professed or have had assassination investigators claim they fired shots that hit the President include Charles Nicoletti, Lucien Sarti, Sauveur Pironti, R. Bocognoni, William Greer, Jack Lawrence, Richard Cain, Valeri Kosikyan, John Rogers, Dave Yaras, Lenny Patrick, R. Gaines, Herminio Diaz, Eladio del Valle and Jack Ruby. You may remember Howard Donahue has proof positive Kennedy was killed by an errant round fired by a Secret Service agent in a follow-up car! It would be best if the LaFontaines identified which of these twenty individuals actually shot Kennedy, then we could decide if Masen had the proper ammunition. Several years ago the LaFontaine's were convinced the assassin was Roscoe White. On November 26, 1990 during a phone call Mary reported she had partial proof. She indicated she had a police report showing Roscoe White made an arrest before he was on the police force. I told her I couldn't figure the connection. Mary replied "It's very complex. We will probably release the information very soon." I can't conceive of Masen being the only gun shop owner selling ammunition for the 7.65 Mauser. Next let's compare the LaFontaine version of the November 18, 1963 Whitter/Miller car chase against the actual report found in the Dallas Morning News, Tuesday, November 19, 1963 Section 4 Page 1. "The next morning, Ellsworth went to Masen's gun shop to find out what happened. The agitated owner told him to read the newspaper. Ellsworth picked up the Dallas Morning News and read the story of the car chase." "When the Thunderbird pulled away, the FBI agent and two detectives radioed for help. Two Dallas police officers cruising nearby in their squad car followed radio instructions to arrest the men in the Thunderbird for a traffic violation. When the patrolmen turned on their toplight and honked for the Thunderbird to pull over, the convertible sped off." "The chase started, patrolmen J.B. Allen and J.R. Sales said, when they saw the northbound car run a red light on Hall and Allen. When they tried to stop the car, it roared north at speeds up to 60 miles an hour. Five blocks away at Hall and Junius, the contraband-laden convertible plunged between two autos halted for a red light. It sideswiped both and squealed on toward Gaston. There the outlaws' car crashed head-on into a utility pole. Sales said Whitter scrambled from behind the steering wheel and ran 30 feet on foot before Sales tackled him." The LaFontaines follow, for the most part, the newspaper account of the chase. They did spice up the episode by claiming the FBI agent and two detectives wanted the Dallas police officers to arrest the men in the Thunderbird for a traffic violation when the paper reported the officers observed the Thunderbird run a red light. Since they had access to the article they should have related more of what it contained. 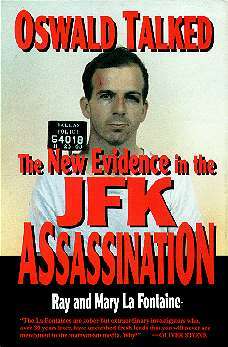 Remember the link between Oswald, Miller, Ruby, Masen, Nonte and the weapons stolen from Fort Hood? The newspaper article states "In the car police found two air cooled .30-caliber machine guns, a .45-caliber "grease gun" sub machine gun and two Browning automatic rifles. The weapons were identified as part of the loot from the Wednesday burglary of the Texas National Guard armorer's shop at Terrell." Terrell is located twenty five miles east of Dallas, Texas. Fort Hood is located just north of Killeen, Texas, 127 miles south southwest of Dallas. Therefore, Elrod's scenario in which Oswald identifies Miller as part of the Fort Hood theft ring becomes questionable. For the story to be credible Miller had to be riding in a car containing weapons stolen from Fort Hood. In fact the car was loaded with guns taken from an armory some 150 miles away. Neither Elrod nor the LaFontaines have provided a link between the November thirteenth theft from Texas National Guard facility at Terrell and Ruby, Miller, Masen or Nonte nor have they shown a connection between Ellsworth's investigation and the Terrell theft. There is more the LaFontaines forgot to relate. In their Hardcopy episode that aired in Dallas on November 16, 1993, Elrod claimed all he told the FBI was "I was in the same cell with Oswald. I never told them [the FBI] anything about guns, gangsters or Ruby." Mary LaFontaine couldn't get much information out of John so she was compelled to interview his brother, Lindy. Lindy wasn't much help either. All he could recount was "I believe Oswald told Johnnie something and he just don't want to come out with it." In actuality the episode was reduced to a non-story. Additionally, Hardcopy briefly showed a copy of the Shelby County Sheriff's report of Elrod's appearance of August 11, 1964. After drinking an unknown amount of beer and vodka it was not his incarceration with Oswald preying on his alcoholic mind but his resolution to kill his estranged wife, Jackie. Since he arrived at the station with a pistol gripped shotgun, the police felt they better take him into custody.